It won’t be long until you can mingle with the literary stars! 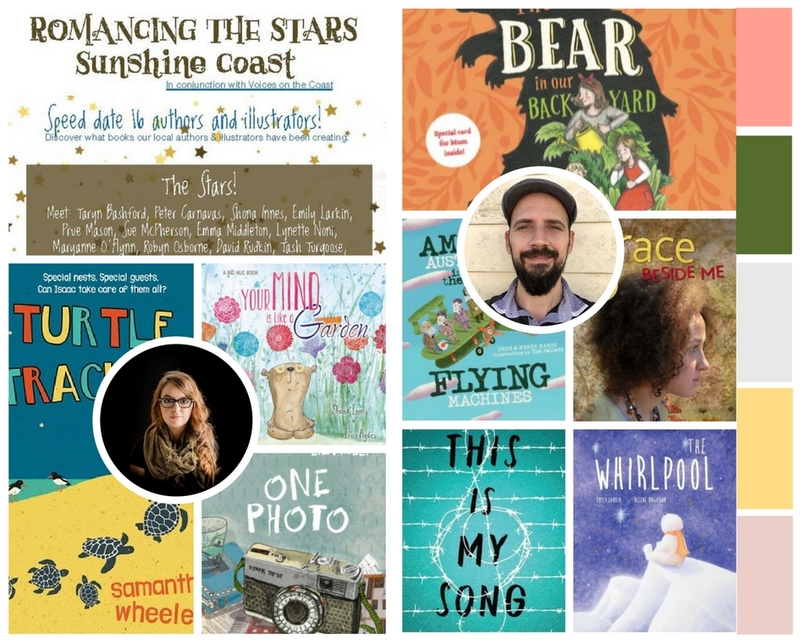 Meet Queensland children’s authors and illustrators who will share their latest books, the stories behind their stories and feed you delicious bite-size insights into what it is like to create stories for children. Now in its 7th year, come and join Book Links and Voices on the Coast, for two nights of entertainment, laughter, knowledge, reading, beverages and canapes, which of course, wouldn’t be complete with a book shop on site! Whether you are a teacher and want to know what will appeal to the children in your class, or a librarian seeking out the latest and hottest books by local authors and illustrators, or perhaps you are a book creator yourself and want to see what everyone has been up to, or maybe you are a parent or lover of children’s literature and want a chance to find out more about the latest and greatest in children’s literature, whatever you are looking for, you are sure to find it at Romancing the Stars! Professional Development Certificates are available on request. There is a choice of two fa bulous locations! A list of the stars, their books and their bios can be found here. Cost: $25.00 for members and $35.00 for non-members. Not a Book Links member yet? Head to our members page to sign up (membership $20.00 per person or $30.00 per family). Book Links Event News for 2017! Renew your membership now to be a part of our stellar year to come! Happy New Year! 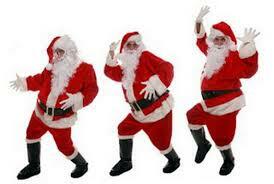 We hope you had a fantastic Festive Season with family and friends! 2017 is looking to be a stellar year for Book Links, our members, our friends, and children all over the place. Read on to find out about some of our events and projects for the coming year! And remember to renew your membership for 2017 HERE! We are hosting three Romancing the Stars events this year! 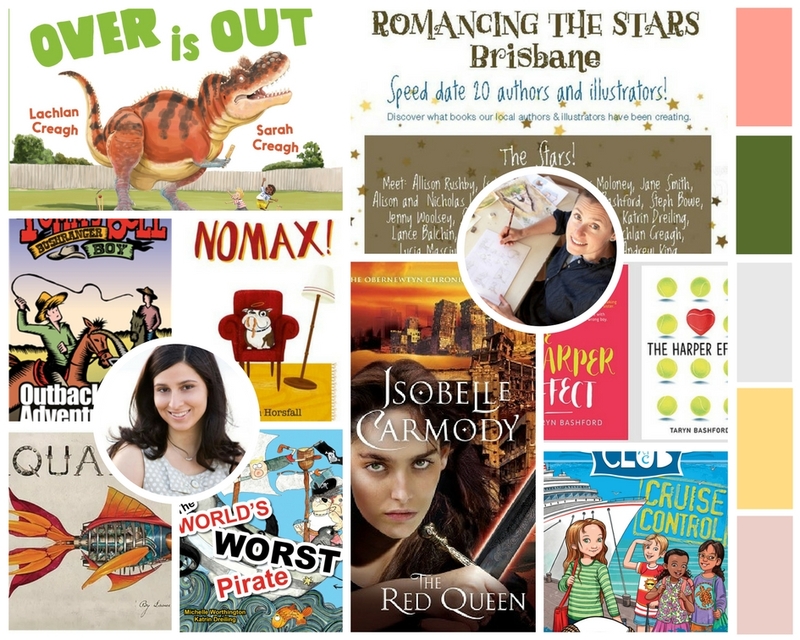 Come and speed-date some of Australia’s best, and South East Queensland local, children’s and YA authors and illustrators to find out what they have been, and are, working on! For information and booking details for the Brisbane Event, click HERE! For information and booking details for the Gold Coast Event, click HERE! For information and booking details for the Sunshine Coast Event, click HERE! We have a full year booked for our Write Links Writing Workshops! Including paid workshops with Richard Newsome, Kerry Brown, Deborah Abela, and Christine Bongers. For a full list of all the Workshops for 2017, click HERE! Libby Gleeson will be presenting the Narelle Oliver Lecture in Children’s Literature in June, watch our social media and website for more details. We are honoured to announce that we will be presenting a comprehensive exhibition of the Late Narelle Oliver’s works in partnership with StoryArts Festival Ipswich. We will also be beefing up our Travelling Suitcases to ensure that they are all utilised to their full potential, and we will also be offering DVD’s of all our featured authors and illustrators for sale, watch this space. BIG news! 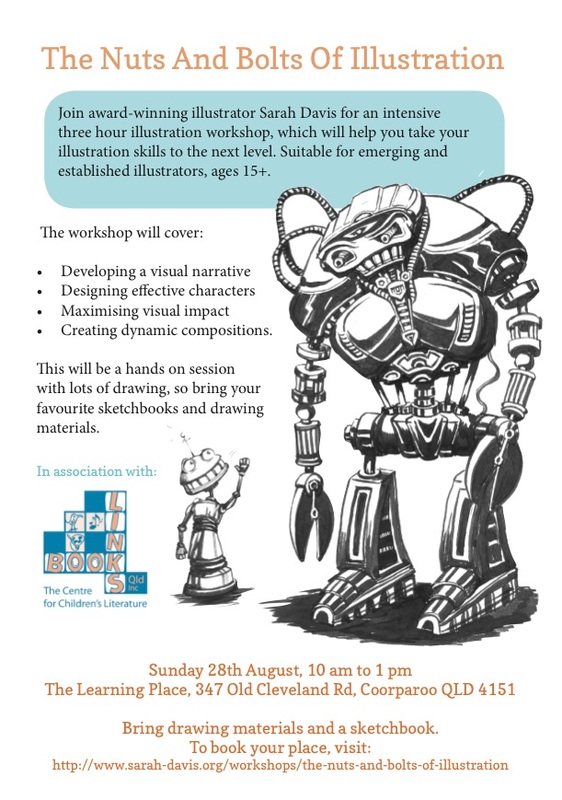 Sarah Davis Illustration Workshop – Sunday, 28th August. Please SHARE, your friends will love you for it! Join award-winning illustrator Sarah Davis for an intensive three hour illustration workshop, which will help you take your illustration skills to the next level. Suitable for emerging and established illustrators, ages 15+. This will be a hands on session with lots of drawing, so bring your favourite sketchbooks and drawing materials. Bring drawing materials and a sketchbook. To book your place, click here! Our friends over at the Children’s Book Council of Australia – QLD Branch have produced a film to tell us all about the Readers Cup. Read on below, and get involved! The Qld Branch of the Children’s Book Council of Australia recently produced a film to promote their state wide competition, The Readers Cup. The film tracks two teams as they prepare to compete in the Ipswich Region Competition. Readers Cup attracts nearly 600 teams each year from across Queensland with regions stretching north to Cairns and west to Augathella. Designed to encourage young readers in Years 5-8, the competition has teams of four reading a set of books, then competing against other teams to answer the quiz questions. Students are challenged to read widely, work collaboratively in a team and continue developing a love of reading. They can compete at regional and state level similar to sporting competitions and meet other students with an equal passion for books. With 589 teams competing across eighteen regions in June this year, and regional teams taking part in the state finals in September, it equates to around 3000 students reading 15 000 books in 2016. Students attending the finals also have the opportunity to attend Wordplay at The Brisbane Writers Festival, one of the sponsors of the competition. The website http://readerscup.org.au/ provides information for teams and coordinators, lists regional books, competition dates and sample questions. The film was funded by CBCA Qld Branch and the Ipswich District Teacher-Librarian Network. 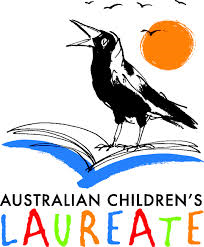 CBCA Qld received funds from Creative Partnerships Australia through the Australian Cultural Fund. Australian Children’s Laureate Leigh Hobbs presented the 2016 Book Links Annual Lecture in Children’s Literature. He spoke to the topic, ‘The mystery of Visual Literacy, and, why isn’t humour taken more seriously’. The event was very well attended by Children’s Literature enthusiasts, Children’s authors, Children’s illustrators, teacher- librarians, and parents. The VIP reception with Leigh, co-hosted by the Queensland Writers Centre, was a resounding success with many attendees reporting delightful and inspiring conversations with Leigh Hobbs. Leigh began by telling us that he feels ‘a responsibility and protectiveness to his audience, children.’ He told the audience that theory is not his thing, but that he would speak to us from his experience as a secondary teacher, a visiting presenter to several countries and his memories of his own childhood. Leigh told us that he has always been obsessed with characters, and they form the basis of all his stories. Leigh does not pretend to write in a child’s voice. He writes with an adult voice and finds that kids relate well to his characters. Leigh acknowledges how sensitive and trusting kids are, and how innately willing they are to engage in learning. Leigh believes in kids’ logic, and explained that not everything needs to be explained to them. Leigh explained that visual literacy is the beginning of literacy as kids learn to look before they can read. He spoke about his characters Old Tom, Horrible Harriet, and Mr Chicken explaining that kids connect to relationships between characters that mean something to them. Leigh works with three levels: first the words, second images and thirdly the contradiction between the words and image. Often the image is doing something every different from the words. Interpretation doesn’t have to be literal. Leigh explained that that if kids like characters, and they’re well constructed, they will be gripped by them in a couple of pages and make a decision whether to keep going into their world. He doesn’t write with ‘a message’, but rather with ‘real’ characters, experiencing loss, friendship and more . The audience was thrilled by Leigh’s lecture, and also enjoyed the opportunity to try their hands at drawing Old Tom with some surprising results. We are very grateful to Leigh for coming to Book Links – the Centre for Children’s Literature to present the Book Links Annual Lecture in Children’s Literature. We are also very grateful to our audience for attending, for without them, this lecture series would simply not be as successful as it is. 2016 Promises to be one of our best years yet. So far we have three innovative Write Links Writing Workshops planned. Brian Falkner – Introduction to Write Like an Author. Saturday, February 6. Peter Carnavas – Picture Books. Saturday, March 5. James Moloney – Planning a Series. Saturday, May 7. Find out more below, and click HERE to book to avoid disappointment. You can also renew your membership, or become a member at this link too. This will give you discount rates to all writing workshops, as well at local Book Shops. Author Brian Falkner has created a set of resources that can be used to inspire young writers to ‘write like an author’. This is an introduction to the materials he has created. For more information on the content visit http://www.writelikeanauthor.com This is a great opportunity to see how Brian presents his workshops for children in the middle years of schooling. 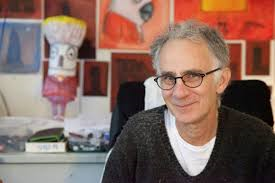 In this workshop, Peter will cover many aspects of picture book creation. There will be a focus on the varieties of narrative structure, characters and how to make your text as powerful and efficient as possible. Peter will also share storyboard tips and how to tell your story visually, whether writing for an illustrator or as an illustrator. Peter completed a picture book course and put together a dummy version of his book, Jessica’s Box. A little while later, New Frontier accepted the book. His tale of a little girl’s attempt to find friendship entered the world in April 2008 and was shortlisted for the CBCA Crichton Award for Emerging Illustrators and the Queensland Premier’s Literary Award. Many books have followed, including Last Tree in the City, The Children Who Loved Books, My Totally Awesome Story (written by Pat Flynn) and The Boy on the Page. He has recently collaborated with Kat Chadwick to create What’s in My Lunchbox?, and has illustrated Damon Young’s picture books, My Nanna is a Ninja and My Pop is a Pirate. Peter lives on the Sunshine Coast with his wife, two daughters and a scruffy dog that occasionally escapes. James Moloney has written a number of successful series for young readers. His ‘Gracey stories’ comprising three YA novels about an Indigenous family was widely praised. Later, he turned to fantasy where series seems the name of the game with the successful ‘Book of Lies’ trilogy and ‘The Silvermay Sagas’. For younger readers he wrote the adventure series, ‘The Doomsday Rats’. In writing these books he ran the full gamut of what to do and what not to do which he will share with seminar participants. The seminar will focus on what publishers are looking for, how to develop characters who will sustain reader interest across a multiple book series, how to keep them fresh, planning story lines across multiple books and the creation of ‘worlds’, both realistic and speculative, which suit the writing of series for the young. The emphasis will be practical and much of the activity interactive, so participants should bring along their cherished ideas and be prepared to discuss them. Season’s Greetings, Membership Renewal, & 2016 Writing Workshops! Season’s Greetings to all! We hope that you are barrelling full steam ahead towards the holidays, and have all your preparations underway. And if you don’t, like many of us, may the force be with you! We have some amazing news for events coming up in 2016. Four writing workshops presented by four of Australia’s industry-leading authors and/or illustrators. To find out more, read on. Now is the time to renew your Book Links membership for 2016. You’ll get discounts at book stores, discounts on event tickets, and all the latest news from Book Links – the Centre for Children’s Literature. Just click here to download the membership form, and you can pay by EFT or cheque in the mail. Receipts will be sent to all members renewing their membership. We have a phenomenal year ahead, and we look forward to you joining us! The Write Links Workshop Campaign! Peter Carnavas grew up as the youngest of four kids with two parents who somehow allowed and encouraged him to pursue his interests without him realising. He learnt the violin and guitar and was pretty certain he would one day become one of the world’s greatest songwriters, sitting somewhere alongside Bob Dylan, John Lennon and Brian Wilson. This didn’t happen, so it was lucky he could draw little pictures of people. Peter has always written stories and scribbled pictures. Every birthday and Christmas present included pencils and sketchbooks. After making little books for family and then teaching for a few years, Peter began immersing himself in picture books. He immediately fell in love with the work of the great picture book creators. Pamela Rushby was born in Queensland more years ago than she cares to divulge. She has worked in advertising; as a pre-school teacher; and as a writer and producer of educational television, audio and multimedia. Pam has written children’s books and television scripts; hundreds of radio and TV commercials; multi award-winning documentaries on Queensland dinosaurs, Australian ecosystems, bilbies, the Crown of Thorns starfish and buried Chinese terracotta warriors; short stories; and freelance journalism. She has won several awards, including a Literature Board of the Australia Council grant to work on archaeological excavations in Egypt and Jordan; a Churchill Fellowship to study educational television in Canada; the Ethel Turner Prize in the NSW Premier’s Literary Awards; three Notable Books in the Children’s Book Council of Australia awards; and a bag of gold coins at a film festival in Iran. Her historical novels include When the Hipchicks Went to War (Hachette 2009), The Horses Didn’t Come Home (HarperCollins 2012), Flora’s War (Ford Street Publishing 2013) and The Rat-catcher’s Daughter (HarperCollins 2014). Pam lives in Brisbane with her husband, son and six visiting scrub turkeys. She has two children (plus son-in-law and two gorgeous grandchildren). The PARRISH PLESSIS series has been translated into many languages and adapted into a role-playing game, while the PEACEMAKER series is being adapted into a novel adventure game. Marianne has also authored children’s and young adult stories, notably the Night Creatures trilogy a dark fantasy series for teens. Marianne is an active supporter of genre fiction and has mentored many writers. She lives in Brisbane, Australia, with her husband and three galahs (and once upon a time three sons–before they grew up). Marianne also writes award-winning crime under the pseudonym Marianne Delacourt. James Moloney has been writing for Australia’s children and young adults for 30 years, with close to fifty books to his credit, among them ‘The Book of Lies’ and the Silvermay series and YA novel such as ‘A Bridge to Wiseman’s Cove’ and ‘Dougy’. His latest book is ‘Bridget: A New Australia’ which is first in a new series by Omnibus focussing on the migrant experience of so many diverse Australians. It was released in February 2015. He also wrote ‘1844 Do You Dare? The Last Horse Race’ part of another new series about Australian history. Once a teacher and a librarian, his books – ranging in audience from seven to seventeen year-olds – have made him one of Australia’s most respected authors. James’ award-winning books have been translated into French, Korean, Lithuanian and Flemish/Dutch. James’ Aussie Chomps titles – The Mobile Phone Detective, Trolley Boys, 68 Teeth and Grommet Saves the World – continue to be popular titles. How can you help? A good question! ‘Tis the season for giving, and for as little as $5, don’t let us stop you there, you can help us get this project off the ground. We’re not expecting to buy all the neighborhood kids cool electric kids dirt bikes, but all kids need a present for Santa on Christmas. We have DGR Status, so any donation over $2 is tax deductible. We will provide you with a tax deductible gift tax receipt to give to your accountant. You can make a donation via our secure PayPal account on our website donate here! By contributing to our Write Links Workshops Campaign, you will enable us to secure the Workshop Presenters for four fabulous workshops in 2016. Consider it a Christmas present for you and for us. Help us to kick start this project, and then attend the workshops in 2016 and beyond! How can you make a booking for the workshops? Just email us! To register your interest in attending the workshops, simply email us ( info@booklinks.org.au ) and let us know which workshop you are interested in. And when we have the workshops locked in, we will email you, and your registration of interest will become a booking, places permitted. Sessions will be $15 for Book Links members, and $25 for non-members. Thank you for your time, and we wish you the very best for the festive season!